Happy Lunar New Year! It is now the year of the pig in Chinese astrology (M’s lucky year!). There are so many delicious traditional foods, across all of the regions that celebrate Lunar New Year, that it is hard to choose one to feature. This year, we decided to go a little off the beaten track, a feature a dish that is specific to Mongolian Lunar New Year, Tsagaan Sar. This holiday is traditionally celebrated with copious amounts of food, including lots of dairy, tea with milk and dumplings. The centerpiece of the Tsagaan Saar (which means “White Moon”) table may be the Ul Boov, a huge layered presentation of cakes and cookies. Ul Boov literally means “shoe sole” and describes the shape of the fried cakes that compose this dish. Check out a video of an Ul Boov being made below. Last week we went to a Mongolian grill with our family, the first one M and I had ever visited. 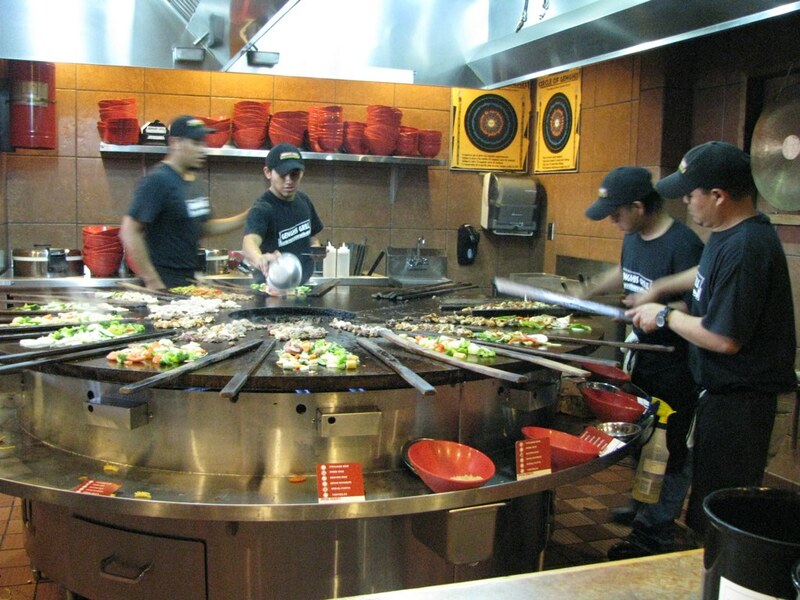 In case you are not familiar, the centerpiece of the modern Mongolian grill type restaurant is a giant round flat top grill manned by cooks with huge metal scraper swords. Before it hits the grill, you pick out your own selection of meats, veggies and sauces from a salad-bar type setup. However, we couldn’t help but wonder – was this really Mongolian-style cooking? While the promotional info for many American Mongolian grills states that this type of cooking originated with Mongolian soldiers cooking large amounts of foods on their shields, we didn’t find any research that really backed up this claim. The Mongolian Grill concept may be Mongolian in some small way, but the major component of the Mongolian grill originated in Taiwan as a restaurant concept to attract customers in the 1950s. Several guidebooks to Taiwan from the 1960s talk about the wonders of Mongolian grill restaurants, like this 1967 example from Olson’s Orient Guide. The groaning hors d’oeuvres tables are generously decorated with platters of spicy, marinated raw beef, venison, wild boar, mutton, and heaping mounds of green uncooked vegetables. The diner makes his choice of the uncooked victuals, selects his all-important sauces and seasoning, and passes to the end of the table where he hands his choices to a clever chef presiding over the charcoal-filled broilers. The seething flames, the sizzling meats, and the spitting oils present an unusual sensory experience. When cooked, the Mongolian feast is something extraspecial for your chopsticks. As when coping with Swedish smorgasbord, you are expected to go back to the Mongolian grill again and again.Try rice wine with the Mongolian barbecue. It is taste stimulating and, while it seems weak, has a high degree of potency. This descriptions sounds pretty similar to the types of Mongolian grills seen today. Another influence is speculated to be Teppanyaki grills from Japan, and also Korean barbecuing. Wherever it came from, the concept has been adopted successful across the US by several chains, and one, BD’s, even spread to Mongolia itself, making it the first American franchised restaurant in the country. If you’re in the mood for some Mongolian-style food from Mongolia, you can try to make some of the simple, hearty fare, including Kuushuur (filled dumplings) and Boortsog (deep-fried cookies). When I think of Mongolian food, I immediately tink “BBQ” probably because that is how it is branded in the US. However, Mongolians have a rich food culture that is surprisingly (to me, at least) dairy-centric. An interesting piece in the Atlantic describes Mongolian staples like fermented mare’s milk, airag. M would be right at home there.